← Tone-deafness, thy name is Moran. It’s not white trash, it’s…retro. My free inverter came with a rilly cool remote control/readout that absolutely does not work. Even though the whole thing is nearly 20 years old, new remotes are available but extremely expensive: Like in the ballpark of $500. And mostly what it does is control inverter modes I would PAY mine not to do. All I really want it to do is tell me what the $%^& battery voltage is. It won’t do that, either. 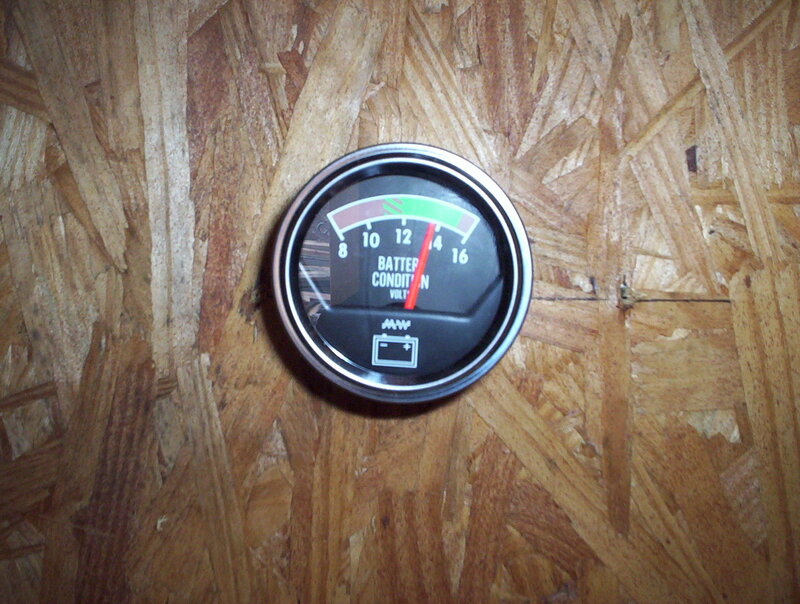 I have looked and looked for a digital gauge that would tell me this. Even ordered one, but it turned out it couldn’t handle the amperage. My multimeter has been permanently parked on top of the inverter for years, that being my only means of reading the voltage, and it’s just ridiculous. A few days ago I was in the auto parts store buying spark plugs for the Jeep. I’ve said it before: I will go full redneck when I have to. 8 Responses to It’s not white trash, it’s…retro. I don’t know, I think it looks like a plenty elegant solution to me. Hell, its even got a chrome bezel; chrome NEVER goes out of style. Well, analog works, kinda, but the digital readout is nice to know when you’re above the magic 12.70v. I just keep a HF cheapo multimeter hooked up. Xantrex LinkPro) battery monitor. A little computer connected to a shunt programmed with Peukert’s Equation beats the hell out of a voltmeter. I’d put it on a switch tho, those old style analog gages eat juice. But it will last forever, Analog is king ! It’s only redneck when it’s still attached to part of the dashboard you tore it out of! You’ll find that that voltmeter eats power. White trash? I’d call it inventive repurposing. I like it. Spud and B have a point, although a proper voltmeter should consume insignificant power. I’d use the multimeter to measure the current draw of the analog voltmeter to see if the drain is acceptable. If you do so, please share, as inquiring minds wanna know. I use a Midnight “State of Battery Charge” meter. It has led readout lights from 10-100% and also tells you the last time the battery was fully charged. It works ok, but only tells what the current voltage is not necessarily the resting battery voltage. 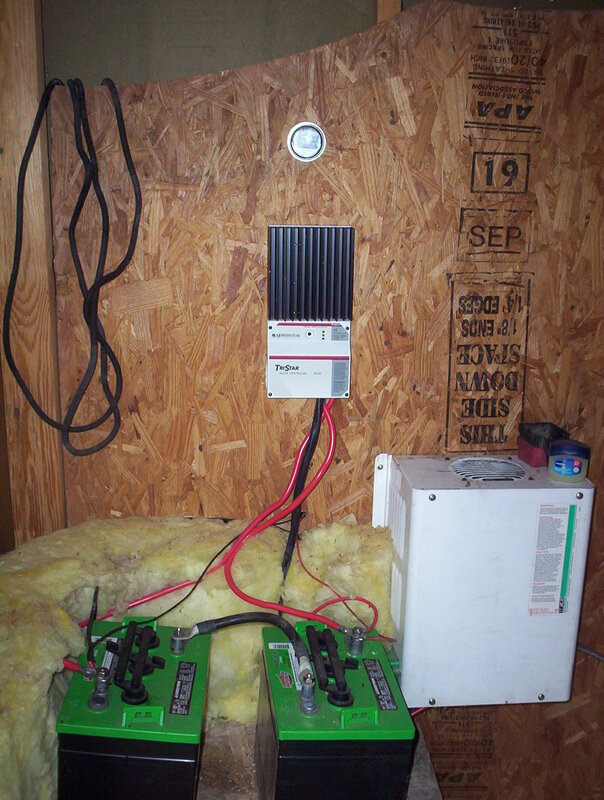 When the sun is out it reads the panel/charge controller voltage minus the inverter load. At night it reads the battery voltage minus the inverter load. You have to isolate the batteries and wait a few minutes to get a decently accurate voltage reading. All systems suffer from this, so just because some meter shows a full charge, it ain’t necessarily so. Do fully charge the batteries each day and use at least 20% and no more than 50% each night if you want the batteries to last through next winter.